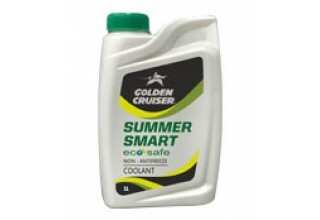 Golden Cruiser Summer Smart ECOSAFE is an ecologically friendly non-antifreeze type full strength tropicalized coolant that provides trouble-free anti-corrosion protection in hot weather conditions round the year. Can be used in any make or model of passenger vehicles. Flush & clean radiator; check & rectify leaks, if any. Change as per Manufacturers recommendation.